Our salad mix season has started! Very exciting! During the summer we have heads of lettuce and the warm weather salad crops like tomatoes and cucumbers. 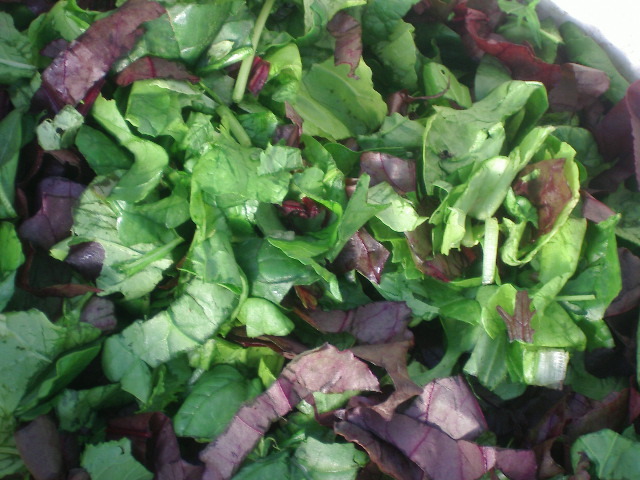 But now we’ve had a couple of frosts and we are starting to harvest mixed salads, mostly from our hoophouse. 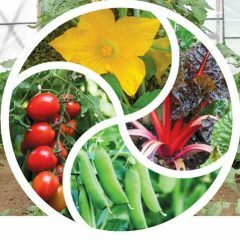 This involves snipping the outer leaves of various crops into ribbons, cutting small individual leaves from other crops and mixing the ingredients. In the photo above are spinach, Tokyo Bekana, Bull’s Blood beet leaves and a speck of Ruby Streaks. There is no lettuce in the picture. In October and early November we harvest the last of our outdoor lettuce and mix that in. Tokyo Bekana in our hoophouse in late October. 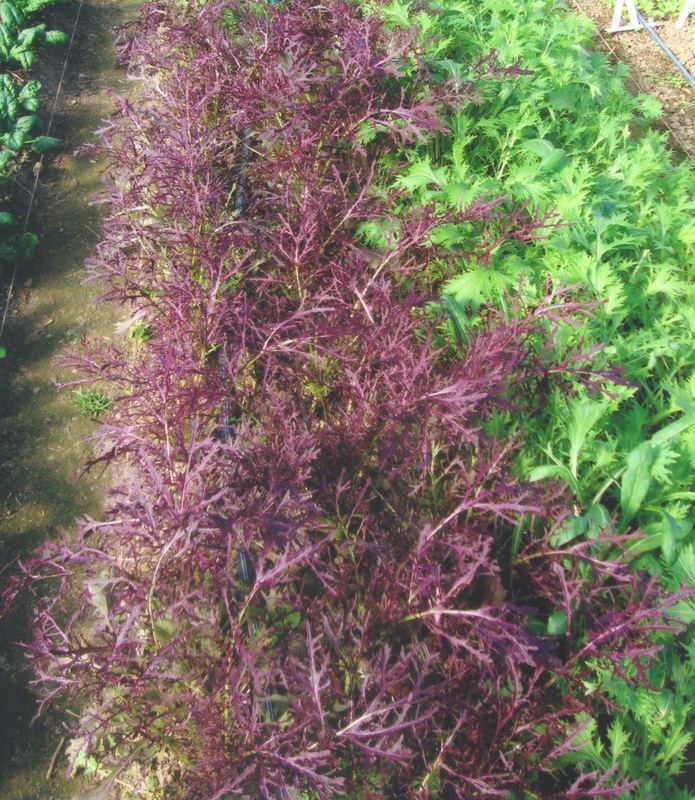 Our general salad mix harvesting approach is to mix colors, textures and crop families. I like to balance lettuce of different kinds with chenopods (spinach, baby chard, Bull’s Blood beet leaves) and brassicas (brassica salad mix, baby tatsoi, thinnings of direct-sown brassicas, chopped young leaves of Tokyo bekana, Maruba Santoh or other Asian greens, mizuna, other ferny mustards such as Ruby Streaks, Golden Frills and Scarlet Frills). I prefer to harvest and chop as I go, mixing everything at the end. It might seem easier to harvest first and then cut and mix, but that requires handling the greens a second time which causes more damage. Incidentally, tearing damages more than cutting, so just get a good pair of scissors and keep them sharp. I cut and gather until I have a handful of leaves, then roll them lengthwise and cut into ribbons. The width of the ribbon depends on the crop. I like to have different size shreds. Mild flavor and plentiful items I cut on the wider side, stronger flavors narrower. I also want every bowlful to get some red highlights, so if red leaves are in short supply that day, I cut those thin. 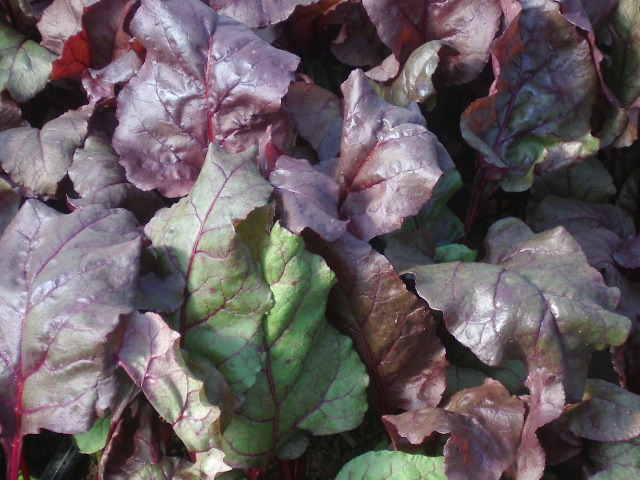 Bull’s Blood beet greens in our hoophouse in late October. Use knives to cut whole heads, if you are doing that. Ceramic or serrated plastic knives cause less rapid browning to cut leaf edges, but almost all growers I know use metal knives. Brassica salad mixes are easy to grow. There are various mustard mixes you can buy, to complement your baby lettuce mix. It doesn’t work well to mix lettuce seed and brassica seed together when sowing, as the crops grow at different rates. It is better to grow separate patches and customize your mix when you harvest. Wild Garden Seed has Wild Garden Pungent Mix, and the mild Pink Petiole Mix. Some seed companies now sell individual crops for mixes (see Johnnys Selected Seeds or Fedco Seeds Asian Greens for example). We mix our own Brassica Salad Mix from leftover random brassica seeds. 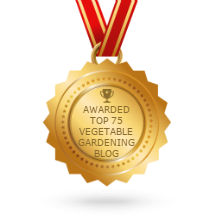 For a single cut, almost all brassicas are suitable, except very bristly turnips. We sow in early February for March and early April harvests. 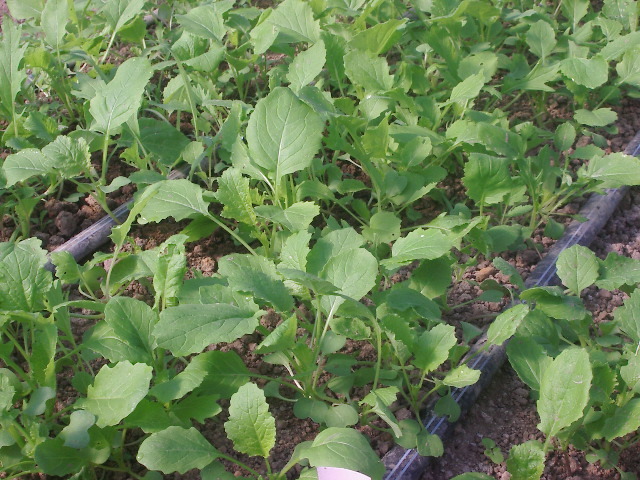 Even if you don’t plan to grow brassica salad mix, keep it in mind as a worthwhile backup plan if other crops fail, or outdoor conditions are dreadful and you need a quick crop to fill out what you have. Our first sowing of brassica salad mix, ready to harvest in mid-October. Young lettuce mix growing in our hoophouse. 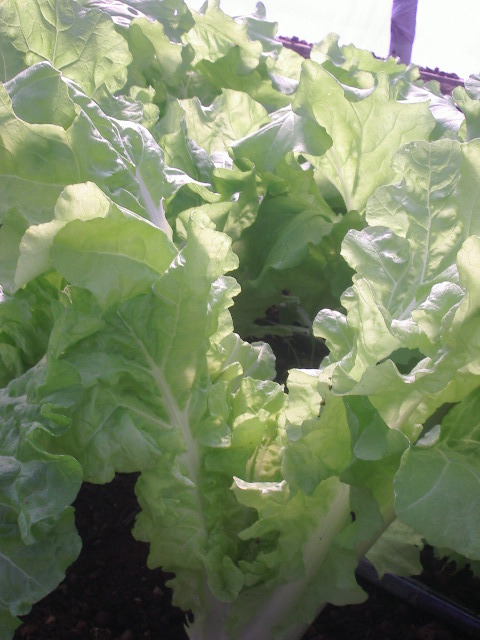 Baby lettuce mix can be cut 21 days from seeding in warm weather, but from November to mid-February, it may take two or three times as long from sowing to first harvest. 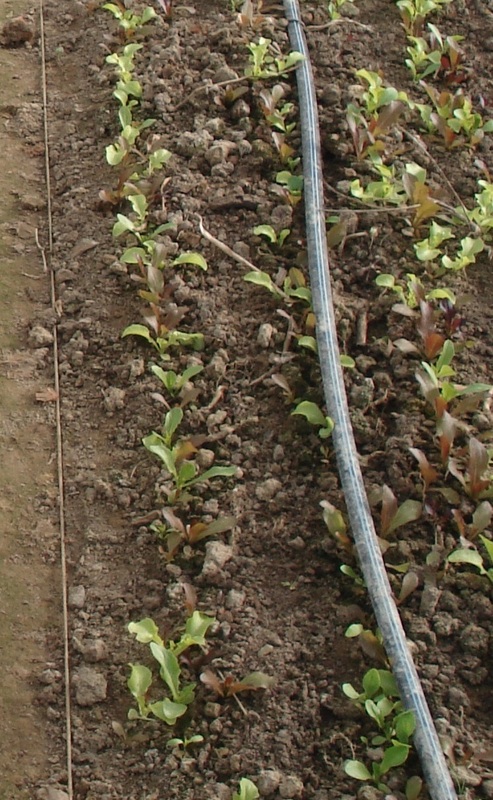 Cool season lettuce mix may provide four or more cuttings, but in warm weather it will only provide a single harvest. Excessive milkiness from the cut stems is a sign of bitterness. You can also test by nibbling a piece of leaf. Our winter salad mixes end at the end of April, when our outdoor lettuce heads are ready for harvest.